The prompt at SepiaSaturday this week contains a lot of snow, a man with a white beard, an overcoat, a lamp post, barrels, houses, a fence, a shovel, and hats. A lot of different things for the mind to focus on. This photograph, however, wasn't taken during the winter. It was taken in August of 1973 in Williamsburg, Virginia. It looks like I am having a barrel of fun, doesn't it? Maybe I'm thinking to myself, "If I click my red shoes together, will I find myself at home?" 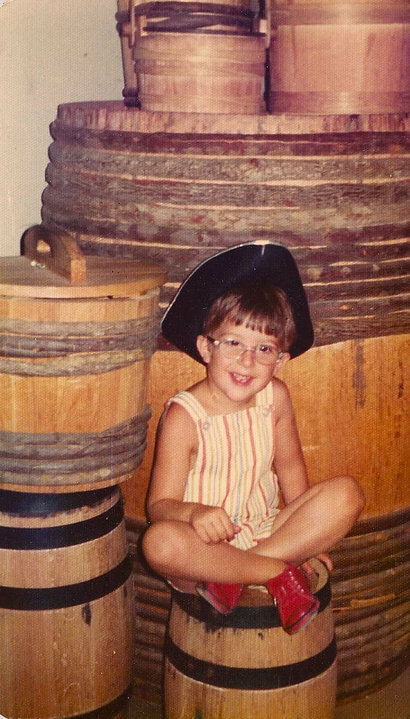 I'm also wearing a tricorne hat approximately 15 years before I would develop literary Francophilia. A 1988 production of Les Miserables led me to read more of Hugo, and then follow him up with Baudelaire, Moliere, and Montaigne. I haven't been the same since. This photograph reminded me of a photograph I had shared in the past. That isn't a barrel the young girl is standing on. That's a bee box. My assumption is that she knew the bees were asleep, or the boxes were empty. The girl might be my grandmother, Myrtle Van Every, who was born in 1900. The young lady on the right might be her sister, Minnie (16 years separated them in age), or their mother, Margaret. The apiary almost definitely belonged to my great grandfather, Melvin Van Every, and if he had a daughter of the age of the girl in the photo, they were still living in Caldwell County, Texas. I do have a couple winter-time photographs to share, though to my knowledge they contain no kin. The Missouri History Museum recently shared a photograph on their Pinterest Board which caused me to do a double-take. The photograph is from February, 1905. The Mississippi River had frozen solid, forming a bridge of ice from one side to the other. The lady isn't the only one crossing the river; you can see a line of people in the background. Source: Courtesy of the Missouri State Archives. 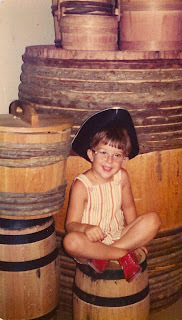 I was in Colonial Williamsburg in August 1973 too -- we may have run into each other and not known it! 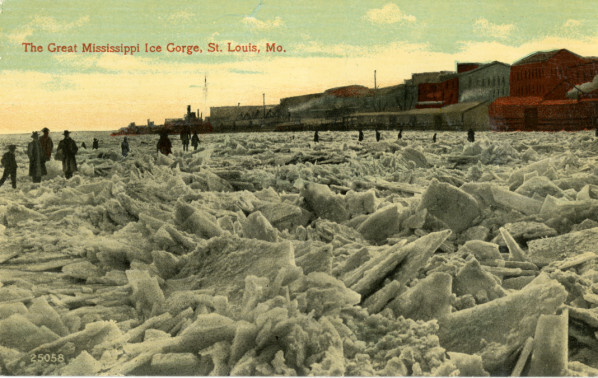 I wonder if the Mississippi ever freezes like that anymore. My mother said they used to skate on the Elizabeth River that separates Norfolk and Portsmouth in Virginia - I've never seen even a thin layer of ice form on the river let alone thick enough to skate on! Claims the river freezes over "once a decade." However, I am in the middle of my fifth decade, and do not recall an ice gorge of the extent in these photos. Maybe other St. Louisans will read this and tell me my memory is faulty. The Missouri State Archives photo does refer to it as "The Great Mississippi Ice Gorge" suggesting a unique event. I've found photographs for 1872, 1905, 1913, and 1940. Nothing since 1940. Great post. The frozen river is amazing! I don't get to see too many frozen rivers in Australia. 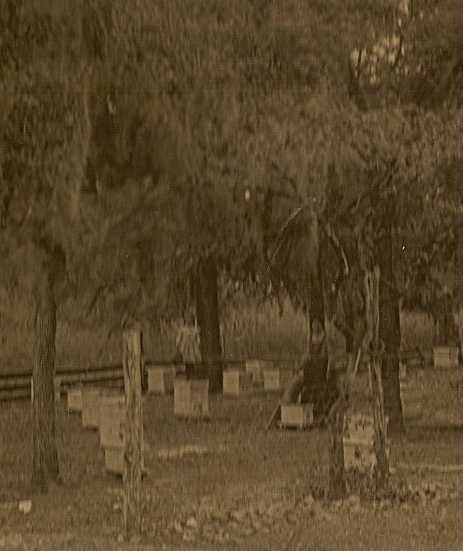 Interesting post with Barrels, Beehives (with little girls being???) and a frozen Mississippi. Not sure if Ian Fleming used it. George Bernard Shaw is often given credit for it. Usage has been tracked back to at least 1874. The photographs of the frozen river are wonderful. I suppose we tend to think of frozen rivers as rare events - it must be 250 years since the Thames froze on a regular basis. I suppose the conditions have to be really cold to freeze what is moving water. I've never seen a river frozen over so that it was safe enough to walk on. Those photos are amazing. Must have been a great outing for the family on a Sunday afternoon - a walk across the river. Not sure I'd be brave enough to cross a frozen river! Mind you know health and safety would probably forbid it! On that first picture, is that a huge barrel behind you? And if so, what was it used for? In high school the teacher told us about GHETI = Fish, the "E" originating from womEn. I have a postcard of ice on the Mississippi in Minneapolis, but I don't think it was frozen solid. I wasn't familiar with the term "ice gorge." However, due to the slightly changing prounciation of the word in some corners, a different example might be better. A late genealogy blogger named Terry Thornton back in 2007 I beieve came up with the idea of a HOGS blogger. (History, Observation, Genealogy, Stories) He nominated my blog for the award. I joked that I was honored, but uncomfortable with the idea of being a HOGS blogger, since I'm Jewish and hogs aren't kosher. So I came up with the idea of a GHOTI blogger, and created the image that remains today on the blog's sidebar. Your progression on this theme was delightful -- you, red shoes, & a barrel, to the girls on a bee box and ending with unusual photos of folks on river ice. Pleased me to no end. Love the barrel photo and in particular the jolly red shoes. The frozen river image is just great. Oh, so funny. Clicking your red shoes. That was a good one. Enjoyed the trip through your pictures. The frozen Mississippi is amazing. The frozen river pictures are amazing. I enjoyed all of your pictures very much. Fascinating and right on theme by rolling out the barrel! The frozen river picture is amazing, but not as arresting as two girls standing on bee boxes!! John, I wonder if you realise that you have word verfication switched on. Most of us on SS have disabled it now as it is a headache for folk who want to comment and can put them off. We mostly use comment moderation and it seems to keep the spammers at bay. Now you are our Facebook friend too you can scroll back and view the interesting thread about WV. Little Nell - Up until a couple months ago I used only comment moderation, and it was fine, then I started getting a lot of spam messages in my moderation queue. Deleting the spam manually was taking up a lot of my time, so I had to add the CAPTCHA word verification for my sanity. It was either that, or turn off comments. I know it can be annoying, but I do indicate above the comment box that if you can't read or hear the CAPTCHA code, you can email me your comments. Yes, you do look to be having fun on that barrel a very cute photo! I've never been a fan of be on the ice- I have to be quite sure that the lake is frozen- we've had good ice around here this year- but still many a vehicles have gone into the water! That tricorne suited you well!! Clockwise: How does one define that word?